While rummaging through the archives of “The Walkerville Times”, (the local history paper/magazine my partner in life and business – Chris Edwards – and I have produced since 1999 about Walkerville and Windsor history), the following article about one of Hiram Walker’s granddaughters jumped out at me. I do hope you like it. Ella Walker (drawn at the time of her marriage to Count Matuschka). Detroit Tribune, June 16, 1897. In 1897, Detroit and Walkerville celebrated one of the biggest social events of the time. “The Canadian Club Girl,” Ella Walker, the only child of Franklin Hiram (a son of Hiram Walker) and Mary Holbrook Walker, announced her intention to marry Count Manfred von Matuschka, a Hungarian nobleman. The wedding was a gala affair. Over 500 guests assembled at the Franklin Walker mansion after church ceremonies. Surrounded by roses and palms, they sampled hors d’oeuvres catered by Sherry’s of New York and sipped “red lemonade” spiked with Walker’s Canadian Club. Reports of the wedding filled many newspaper’s society pages. Ella’s extraordinary life provides a glimpse of Detroit and Walkerville in the Gilded Age (1890-WWI), as well as a compelling personal tale. Both are the subject of a book project launched by University of Michigan professor Jennifer Widner and several colleagues around the world. Widner spent a month at the Rockefeller Foundation’s research centre in Bellagio, Italy. Each day she passed a photograph of an older woman who had a special sparkle in her eye. Upon learning that the woman was the original owner of the estate and that she had come from the Detroit area, Widner wanted to know more. So did her fellow scholars. Ella was born in 1876. She entered wealthy Detroit-Walkerville society whose members were beginning to turn their attention to art and philanthropy. As a teenager she watched her uncle, Edward Chandler Walker, help launch the Detroit Museum of Art (now the DIA). She may also have encountered Charles L. Freer, the local business magnate who later endowed the Smithsonian Institution with his extensive collection. And she would have known James McNeil Whistler’s aunt and sister, both of whom lived nearby. Married life was not always easy. Ella settled with the Count in Upper Silesia after their marriage. He was a naturalized German citizen and when World War I broke out, the Count fought on the side of the Kaiser. The U.S. Government confiscated Ella’s property, including businesses in which she had a joint interest. Ella also lost her U.S. citizenship. She lived a humble existence behind the lines in Berlin, to the distress of her parents. 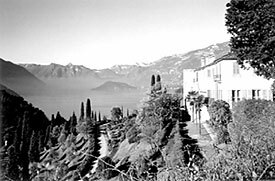 Ella’s home, Villa Serbelloni, overlooking two branches of Lake Como, with the village of Bellagio, Italy below. The interwar years were turbulent. In 1926, Count Manfred died. Four years later, Ella re-married, but the union lasted less than two years. In 1932, Ella regained her U.S. citizenship and married for a third time. Her new husband, Prince Alessandro von Thurn und Taxis, the Duke of Duino and Prince of Torre e Tasso, was a naturalized Italian citizen. The two settled in Italy but appear to have lived much of the time apart, while he sought to re-build the Castel Duino near Trieste, his seat, and she sought to renovate the Villa Serbelloni on Lake Como. The Prince died five years after the marriage. In the last quarter of her life, Ella’s project was the restoration of the Villa Serbelloni and its grounds. A site of considerable historical significance, the Villa itself had fallen into use as a hotel, and Ella set herself to the task of its rescue. When German occupation forces moved in, she escaped over the Alps to Switzerland, returning at the end of the war to continue her mission. On her death in 1959, Ella left the Villa to the Rockefeller Foundation to promote international understanding. She gave much of her remaining fortune to her adopted daughter. And she remembered the local tie too. 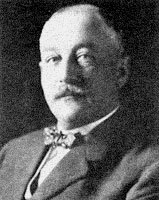 Franklin H. Walker, Ella’s father, was the first member of the Hiram Walker family to attend college, the University of Michigan. Ella left the University of Michigan a gift in her parents’ names to help extend educational loans to needy students. This entry was posted in Fashion, People, The Straits, Walkerville, Windsor Now, Windsor Then and tagged Canadian Club, Count Matuschka, Ella Walker, Hiram Walker, History Babe, Jennifer Widner, Ontario, research, The Canadian Club Girl, Walkerville, whisky, Windsor. Bookmark the permalink.